Singer and songwriter Kaspars Dimiters has been a major voice in Latvian music for decades now. His lyrics are often deeply personal, as well as being blunt and unvarnished observations about life in Latvia – how difficult it is for many and the struggles and challenges many face. His repertoire includes songs that touch on topics like alcoholism, drug abuse, corruption, and poverty, and, consequently, many of his songs are often dark and disturbing, but are still, on occasion, positive and hopeful. 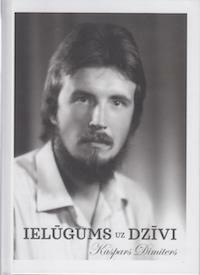 Dimiters’ work as a songwriter now covers many decades, and, in 2017, to celebrate his 60th birthday, the artist released a combination book of lyrics and digital song collection entitled Ielūgums uz dzīvi, that collected 100 of his songs. It is telling that one of Dimiters’ best known and most celebrated albums – 1994’s Krusta skola – is included in its entirety on this collection. This album, recorded with guitarist Gints Sola (who many will know from his work with Jauns mēness), is both polished and refined, with many songs inspired by his work with his Krusta skola center for troubled youth, as well as work with those suffering from alcohol or drug dependencies. Songs like ‘Glāze ūdens’ and ‘Pasaule ir tāda skola’ are, like many of the songs on the album, wordy and weighty, as Dimiters presents his often bleak world view. Perhaps Dimiters’ best work is his 1988 album Mans kumoss pilsētas baložiem, and, for that era in Latvia, the album was almost revolutionary, considering its topics and lyrical style were different than just about everything else in Latvian music at the time. 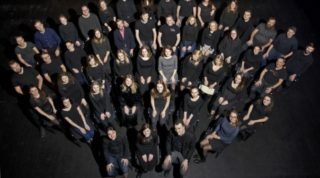 Perhaps only Dimiters could write a song like ‘Suņa dzīve’ – a heart wrenching song about a drunk and his dog, or the touching ‘Muzikants’, a song about a musician who dies mid-performance and is quickly replaced by someone else and forgotten. Ielūgums uz dzīvi contains almost all the songs from this landmark album. 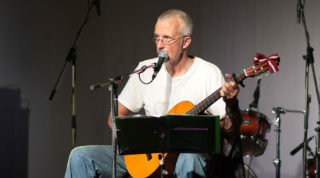 Over the course of 100 songs, from his earliest songs (written in the 1970s) to songs written recently, Dimiters displays a broad range of emotions and topics. From the tragic ‘Fukušīmas suns’ (a song about the Fukushima disaster), to the hopeful ‘Visu Latvijai dodu’ (one of Dimiters’ few hopeful songs about Latvia), as well as the cynical ‘Dziesma par nolaupītajiem grašiem’ (Dimiters’ lament for the greed that he observes everywhere in Latvia), Dimiters can be at times bluntly harsh, as well as tenderly optimistic. Dimiters also finds inspiration from his Orthodox faith, in songs like ‘Puisēns ar lukturīti’, ‘Dzejnieks un svētums’ and ‘Nāve ir dzimšanas diena’. However, it does become clear that Dimiters becomes even more cynical with each passing year, and he has been an outspoken critic of Latvian politics and society throughout the years. Though the album does include one hundred songs, which is probably more than enough for the average listener, one does wish that he did include more songs from earlier in his career. Most of the songs on the collection feature just Dimiters on vocals and guitar, and though that is certainly appropriate considering the personal nature of Dimiters’ songs, it does mean that the songs can sound very similar, if not occasionally monotonous. It helps that some of Dimiters’ songs from the 1980s (which often featured a full band) are sprinkled throughout, offering a change of pace from his more weighty songs from the 1990s and later. Some curious omissions are the rest of the songs from Mans kumoss pilsētas baložiem (such as ‘Ne šlāgerēt, ne līderēt’ and ‘Ne šlāgerēt, ne līderēt’) as well as other songs from his earlier period – like the beautiful and wistful duet with Sandra Ozolīte ‘Noburtie’ or the energetic ‘Rozianna’. However, almost all of Dimiters’ songs can be found on his website, for those looking for more to listen to. Of course, if it is difficult to discuss Kaspars Dimiters without mentioning how controversial many of his words and actions have been throughout the years. Dimiters has spoken negatively about immigrants, politicians, diaspora Latvians, western liberals, and has reserved most of his extensive venom for homosexuals. Unfortunately, many of his abhorrent views have made it into his songs, but, fortunately, there are few of these kinds of songs on this collection – mercifully, songs like the dreadful ‘Zilā pasaka’ are not included here. The one hundred songs (more than seven and a half hours of music) on Ielūgums uz dzīvi may be too much Dimiters for some. Others may find some of Dimiters’ expressed views to be so offensive as to dismiss listening to any of his songs out of hand. There lies the main puzzle of Dimiters – how can someone who, at times, espouses such extreme and hateful words be able to create such beautiful and moving songs? For those that are willing to give them a listen, Ielūgums uz dzīvi does indeed contain many songs that reveal Dimiters to be a songwriter without parallel, someone who writes very pointed and direct songs. Though often harsh and bleak, Dimiters’ songs can also be very affecting and poignant, with a direct and realistic language that few other poets have, and this collection is a thorough overview of Dimiters’ large contribution to Latvian music throughout the decades. For more information visit Kaspars Dimiters’ website.